Featuring eight of the most intense athletes of Monster Jam, Central Valley fans will witness a fierce battle for the championship with each Triple Threat Series competitor contending in customized high-powered vehicles: Monster Jam Speedsters, Monster Jam ATVs and of course, the iconic Monster Jam trucks in six events sure to leave fans on the edge of their seats. 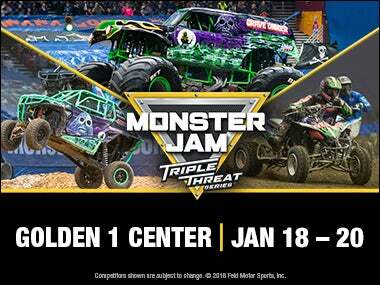 Sacramento Monster Jam Triple Threat Series 2019 tickets go on-sale to the public Tuesday, September 25th at Golden1Center.com. Venue pre-sale starts Thursday, September 20. For all the latest news, announcements and updates, be sure to watch theMonster Jam 2019 Season Kickoff Show live streaming on MonsterJam.com on Tuesday Sept 18th at 4:00 p.m. Fans also have the unparalleled opportunity to get up close and personal to their favorite Monster Jam trucks and drivers at the Monster Jam® Pit Party pre-show experience for photos & autographs.